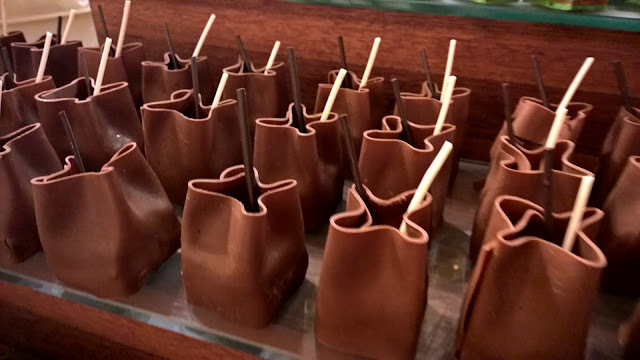 In recent posts on restaurants at Shangri-la Hotel in Abu Dhabi, I commented on the new energy that I felt running through the hotel's F&B products. Of course the last year has been a time of tremendous change at the hotel not only in terms of staff, but more importantly, in a realisation that as good as its products have been in the past, other hotels had not only caught up with them, but in some cases, eclipsed them. 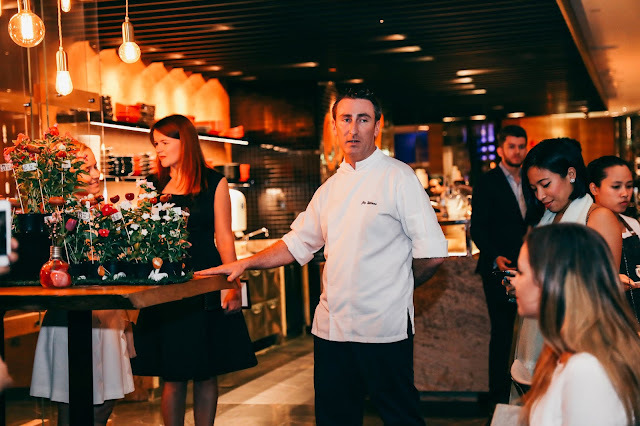 The recent refurbishment of Sofra Bld, the hotel's all-day dining restaurant, was a bold statement of intent to get back on track. 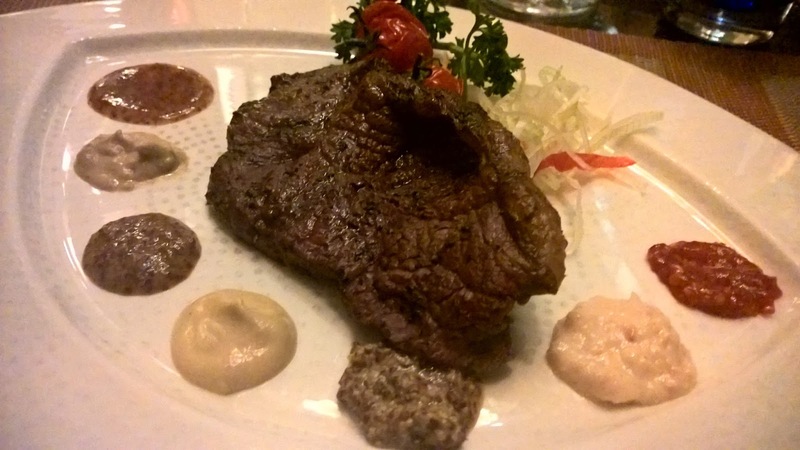 I had the chance to try its Rodeo Night, an evening of indulgent meat cuts. The buffet felt smaller, with fewer dishes compared to previous visits. I see this not as a weakness, but as a strength. Fewer dishes, but of a high quality seems to have replaced the old buffet which really had far too many dishes. The new approach gives greater control over quality. Also, it allows the chefs to focus on greater attention to detail because there are fewer dishes. 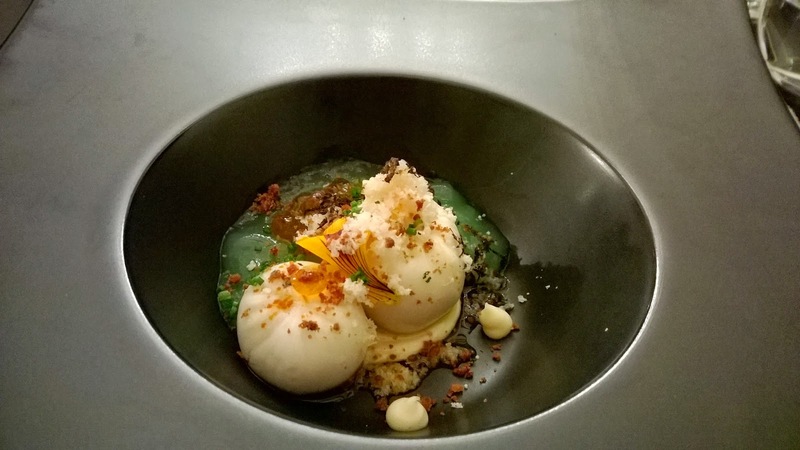 This manifested itself in the plating that I noticed in some of the dishes. I remember a Rodeo night in the past that I attended. My piece of beef then was just plonked down on my plate. Not this time. Even my daughter's quail had a wonderfully child-like joy about it. If you are going to have an evening that celebrates meat, there should be no half measures. There certainly are none here. I liked the butcher feel to the presentation of the meat. It is visual. Raw. Primal. Australian tenderloin, Short loin, and veal rack chops lay beside US striploin, Rib eye and Brazilian tenderloin. 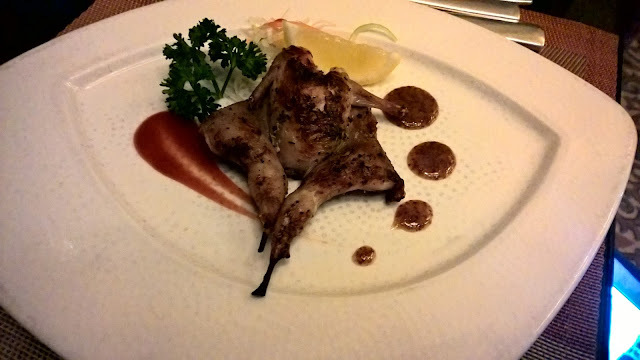 My daughter, a big lover of red meat, chose to go with quail instead. The variety of meat on offer really surprised me. The concept also allows for very natural engagement - choose your cut and ask for it to be prepared to your desired temperature. 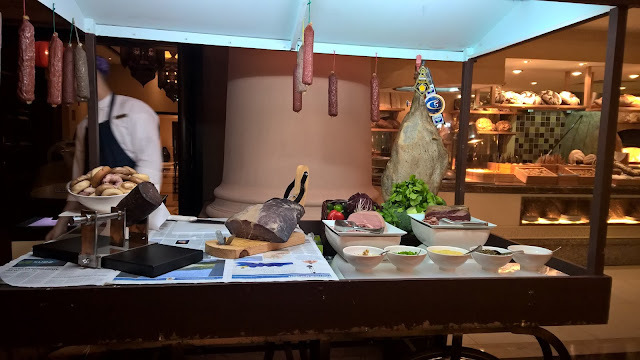 The meat station made me feel I was at a real meat night. Oh, I was also impressed by the fine cured beef selection, reminding one of the meat theme on the night. This is still one of the best dessert stations in the city. 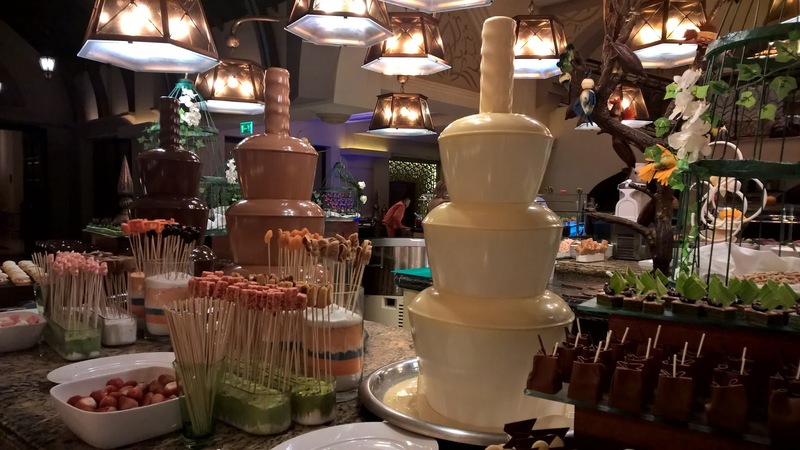 The often photographed chocolate fountains remain a highlight. I have been to maybe one other restaurant in Abu Dhabi where these is a choice of three chocolate fountains. So how do you fix something that isn't broken then? Well, you make it better I guess.The hotel's own branded brie was a definite highlight for me. This is a must try on your visit. 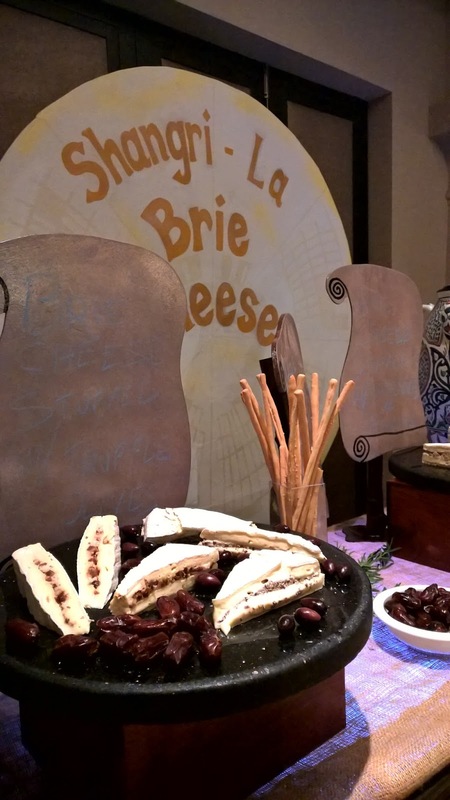 Make sure to try the Brie stuffed with walnuts and raisins and also Brie stuffed with dates. The restaurant's service remains its undeniable strength. Staff are very attentive and there seems to be an unspoken philosophy to the effect that 'if it is possible, we will do it'. To this day my daughter loves going back time and again because staff remember who she is. And no, it is not because her daddy is a blogger. They seek to connect. Yes, some staff may not know their Merlots from their Cabernets, but they more than make up for it with that Shangri-la service that is found at only a handful of hotel restaurants in the city. After a bit of dithering with concepts and pricing, I think Sofra Bld has finally got it right. 285 AED for a week night buffet is not cheap, but when you can put on quality dishes, it starts to look like a very good deal. And this is what they did. 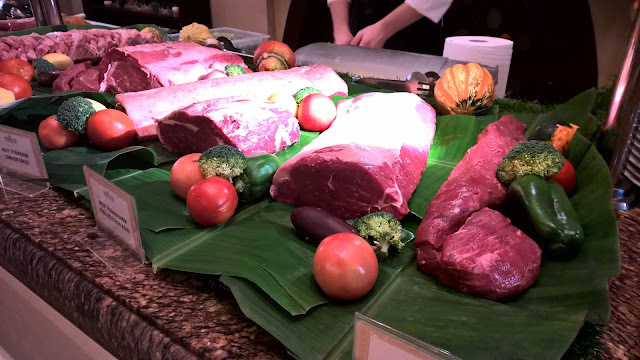 Prime beef is what one wants at a Rodeo night, and the selection surpassed my expectations. On a side note, I found the music selection to be odd. Jazz really goes with Sergi Arola's P&C. Sofra Bld, on the other hand, is lighter and family oriented. It needs to find its own identity, and music is one of the ways to create it. Based on the Rodeo night, Sofra Bld is genuinely a player again as far as all day dining goes. The cosmetic changes made in the restaurant run deep. For a while I have been talking about the soul of the restaurant as found in its staff. Now I can talk about the exciting concept where quality reigns again.